Moving from the BBC to ILR Bob spent many happy years at the Kent ILR Invicta Radio, presenting, producing the odd commercial and programming and fitting in a weekly show for Radio Fax in Ireland. Events changed as Invicta was taken over a number of times, Bob jumped ship to set-up his own station Medway FM the last UK ILR whilst assisting many other stations throughout Kent. 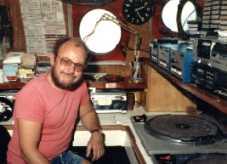 During the 1990'2 Bob was invited to present programmes on Radio London and Radio Northsea International when they returned from ships off the Essex Coast. He did programmes for Juke Box Memories, European Classic Rock, and then joined Radio Caroline working out of the Maidstone TV Studios and later in Larkfield. For over a year Bob was the voice of Virgin Radio's top of the hours commercial. He also made programmes for Radio Seagull and the Voice of Peace. 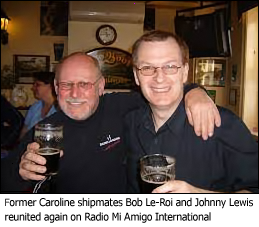 When Medway FM was sold Bob ventured overseas to Malta to run Calypso FM taking the station from the bottom of the league to Number 2. Bob briefly worked for BFBS TV as a transmission controller continuity announcer. He then set about bringing radio back on the Forts, 40 years after leaving originally. Red Sands Radio was conceived which broadcast from the Red Sands forts and continued from Whitstable harbour in all for eight years. History of 'Bob's 60s Splash' programme has been aired by many stations since the 1980s. Produced 'live' in the Offshore Radio way and interspersed with newly produced jingles, the original concept has since been copied but this is the original '60's Splash'.